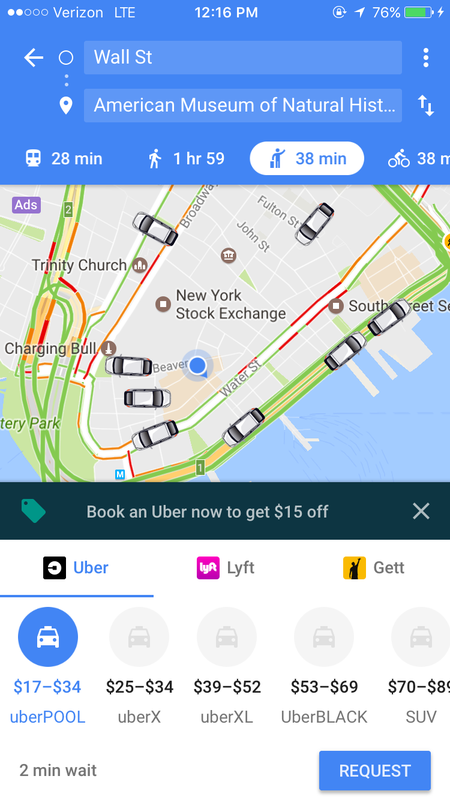 Update 1/24/17: Both new and existing Uber riders can get $15 off their next Uber ride by booking directly through Google Maps. Once you’ve selected your destination, a pop-up icon will appear with the $15 discount offer. From there, you can select which type of Uber ride you want to take — UberPool, UberX, UberBlack or anything else. Note that your Google Maps and Uber accounts must be linked in order to take advantage. Google Maps is making it simpler to book an Uber ride, letting users request a ride without ever having to leave the app. Users can track their car, communicate with their driver and pay for their ride, all through Google Maps. The list of price estimates, which Google calls the “ride services” section, has also been redesigned. Now, users will see nearby cars with price estimates along the bottom. They can click on the service they want (Uber Pool, etc.) and start the process. The Uber integration works even if users don’t have the actual Uber app on their phone. Given recent concerns over passenger privacy, this might be a great (and possibly more secure) alternative. The update is rolling out today for both Android and iOS. If you don’t already have an Uber account, you can sign up here to receive additional free ride (up to $20) from TPG. Also keep in mind that you should sync a credit card with your Uber account that will earn you the greatest return on your ride, such as the Chase Sapphire Preferred for 2x points per dollar on travel. Have you booked an Uber ride through Google Maps?